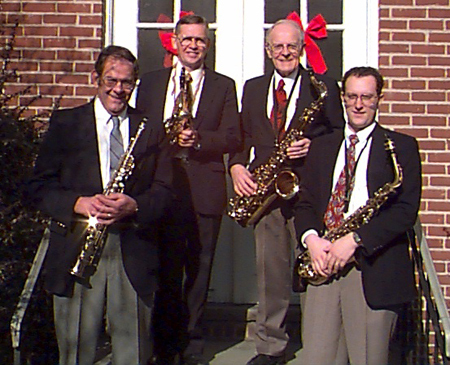 The Diamond State Saxophone Quartet is a hobbyist ensemble which has been playing saxophone quartet music since 1972. Although we mostly play for our own enjoyment, we occasionally play for a church, nursing home, or for a special occasion like the annual Separation Day celebration in New Castle, DE. DSSQ does not meet on a regular basis, but we try to get together every two or three weeks. John Mills passed away in 2018 at age 86. A music graduate of Oklahoma University, John had a long career as a middle school music teacher, and as a private teacher to many of the best musicians in this area. He played in many bands and other musical groups including the Serenaders and Rhythm Doctors big bands, the Limestone Clarinets, and the Diamond State Saxophone Quartet. He is missed by all of us. DSSQ began in 1972 with John Mills, Al Bates, George Paris, and Bruce Evans. George dropped out a few years later. John Mills died in 2018, and Al Bates had a stroke in the same year. Current DSSQ members are Bruce Evans, David Kee, and George Whitmyre. Jay Priester will probably beome the fourth member if he agrees to it. While Al Bates remains an honorary member, he is currently inactive. Former members include Dan Coppens, Bob Beeson, Jay Mills, Jim Anderson, and Charles Wickam. Bruce is a retired Dupont chemist. He studied music at the University of Delaware after his retirement, and has arranged many works for saxophone quartet. His website www.bruceevans.net is known to sax players worldwide. It offers more than 100 sax quartet arrangements which are free to download. David is a graduate of the music school at West Chester University. He has a career as an instrument repairman through his company Musically Sound. He specializes in flutes, but has expertise and experience with all other wind instruments. David has played with many musical groups of various kinds throughout the Delaware Valley area. George is retired from the University of Delaware, where he was a machinist in the Physics Department. He continues to design and build specialized Physics equipment for universities and others. He also manufactures steel drums.